The Wolf Man is the filmic manifestation of a folkloric character, the werewolf, a man or woman who is supernaturally transformed into the shape of a wolf and endowed with all of the animal’s physical characteristics. The monster embodies “freakery” because it destroys boundaries and blurs the line of what society considers human. Jeffrey Cohen would describe the Wolf Man as a “refusal to participate in the classificatory order of things” (Cohen 6). He also touches on the idea of creating freakery or a hybrid of two forms, either voluntarily or involuntarily, a detail that changes throughout the many films. The Wolf Man character skirts the boundaries of what it means to be human and animal and thus is a shining example of freakery. The most well known film is the American werewolf horror picture, The Wolf Man. Released in 1941; this film set the golden standard for all the Universal Studio monster movies that followed, except in regards to the transformation scene. Each director saw this scene as a chance to insert his own creativity in the story. The film actually was not the first werewolf movie and was preceded by Werewolf of London in 1935. 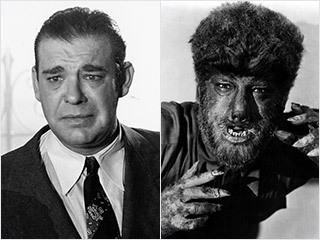 Other popular films in which the Wolf Man makes an appearance are Frankenstein Meets the Wolf Man (1943), House of Frankenstein (1944), House of Dracula (1945), and more recently Alvin and the Chipmunks Meet the Wolfman (2000) and The Wolfman (2010). The original 1941 release is still the most praised version; not only because of its cinematic value but also for the impact it had on future werewolf films. Both Wolf and The Howling adopted the original plot template introduced by Universal and this subject became a point of interest for J. Robert Craig in his publication, The Origin Story in Werewolf Cinema of the 1930s and ’40s. Interestingly, The Wolf Man is one of the few monsters without a direct literary source. 3. NASHAWATY, CHRIS. “Monster Mash.” Entertainment Weekly 1227 (2012): 66. EBSCO MegaFILE. Web. 23 Nov. 2013. Great post! I like your reference to the Wolf Man’s transition from “folklore” to “film.” We’ve talked a lot about adaptation throughout the course, and I’m curious about this transformation from text to image. Might there be a way to equate genre, or the alteration of genres, with monstrosity?